Using whatever yarn I had handy (I like to mix yarns of different textures and colors), I made them to the specs the Humanitarian Center had given me: 60 inches long by 5 inches wide, and no fringes. It takes me about 2 hours to fashion each one. I prefer to use a simple stitch - double crochet - and play with the color scheme. This way, I make many scarves - the whole point of my project. Unlike previous scarves, this one is worked horizontally starting with a long (60 inches) Double Base Chain. With the DB Chain, instead of starting with a chain that is 60 inches long, you do the chain and the first row of double crochet at the same time. Once you get to 60 inches, start the new row. Depending on the weight of your yarn, you will need about 7 rows (medium weight), or 5 rows (bulky yarn). Also, I always, always, use a hook that is larger than required for the yarn, which guarantees the project will have a soft hand. For a great tutorial on the Double Base Chain stitch, go here. In 2011 I made almost 50 scarves. Last year, with all I had going on, only about 20 or so were produced. I am hoping I will 'get with the program' and make a lot more in 2013. This picture shows the 7 I delivered. I have a friend who is using a loom, and will make scarves and hats too. Making scarves is really easy, it will keep many people warm, and it can be worked on while you are watching TV or traveling, as you can use the same simple stitch with no need to look at a pattern. They also make great gifts for grown ups and children alike! My favorite yarn combination for a very soft scarf is Lion Brand Homespun with any brand of Fur yarn on coordinating or contrasting color. I hope this post will inspire you. 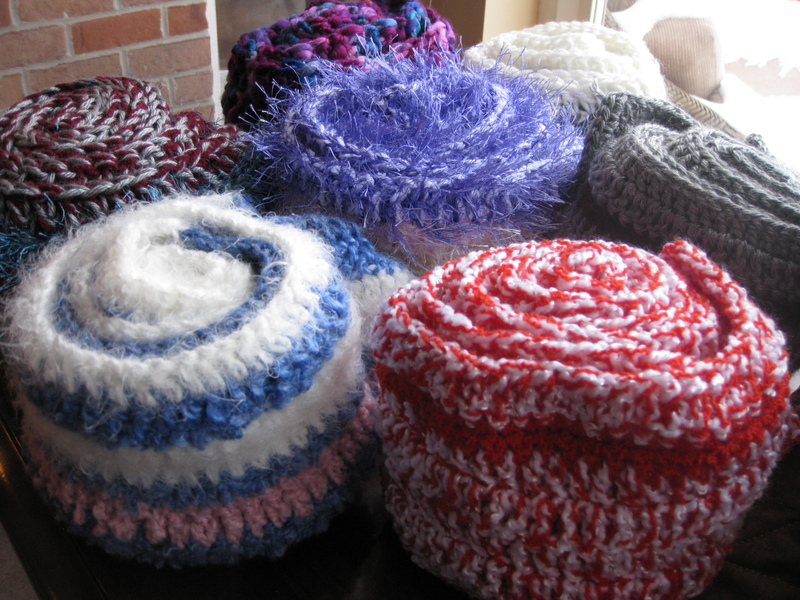 Find a shelter in your city, search for yarn sales, and dig out your crochet hook, loom, or knitting needles! Tínhamos um grupo que fazia quadradinhos de croche e alguém depois fazia as colchas para moradores de rua e era distribuidas junto com alimentos e /ou sopa,Depois minha vizinha foi para Friburgo e não tenho mais notícia se isso ainda acontece.Hoje faço algumas colchas de malha e ribana no overlok,é rápido e fácil.Mando para umamigo que faz as doações.É um grande feito e Deus nos ajude.BeijoGRANDE.Muitoooooos abraços.